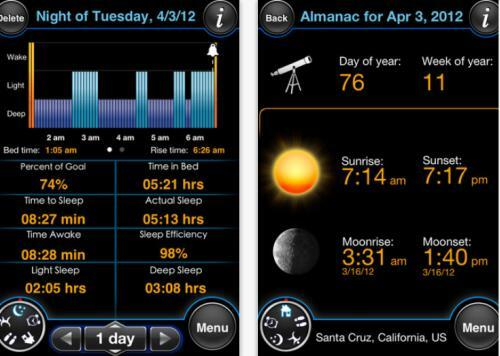 Mobile applications can help us with a variety of everyday tasks bedsides offering solutions to any problems we may have, and all of us at some time in our lives may suffer from some sort of insomnia but better understanding our sleep patterns can help us overcome this, and the MotionX Sleep iPhone alarm clock app may be of some help. The application can help users sleep better so they wake up refreshed and better tackle the day ahead and be more active. It cleverly monitors sleep cycles and helps users visualize their sleep patterns, and works by the handset being placed on the bed working with any mattress including Tempur-Pedic. MotionX will awake you at the optimum time during your sleep cycle using the easily set up Smart Sleep Cycle Alarm, and users can be either awoken by their favourite iPod song or by the in-built sounds of the app that includes sounds such as waves, rain, jungle, ocean, and many more. The application also tracks your daily steps and calories burned during the day, and the Get Active alerts will let you know if you have been inactive for too long. The voice coach will announce progress updates to inspire you to keep moving. MotionX 2.0 has recently been updated and is being offered for the special spring price of Â£0.69/$0.99, which is eighty percent off for a limited time. MotionX works with the iPhone, iPod Touch and the iPad running iOS 4.2 or later. Users that have already downloaded the application have given it a lot of praise so far saying how accurate it is. Users are advised to place their device according to the instructions either in the bed or in an armband so the app can correctly monitor sleep and wake you at the best time, and the application can be found on the App Store.